We’re a nation of multi-taskers, often keeping an eye on our phones or other devices even while lounging on the sofa watching television. And those devices need power. Who wants to keep getting up to plug stuff in when you’re bingeing a great show, reading a good book or otherwise chilling? Turns out, you don’t have to. Furniture makers are responding to our multi-tasking lifestyle with seating and surfaces featuring integrated sockets and USB ports. All you have to do is position your chair or table within range of a wall plug to keep the juice flowing, and then you can tap into the furniture’s power source. On some pieces, the power access is in an armrest or base panel, while others have it built into the legs, side panels or drawers. Another clever hiding spot: lamp bases. Lamps Plus has many options, including the Karla table lamp from 360 Lighting, with a sleek brass or polished-steel column. A pair of Ledger mercury-glass table lamps also come equipped with USB ports. Or consider Ikea’s Varv floor lamp, with a sleek adjustable base that let you charge a phone just by resting it on the charging pad. There’s an additional USB port built into the lamp. Room & Board has several smart-looking pieces for various rooms. A classic Parsons bed has ports and plugs on both sides of the headboard. The iron frame comes in a range of colors, including fun ones like red, green, pink, ocean and blue. The Portica end table comes both standard and C-shaped, which can be useful for tight spaces. Choose your own top: glass, quartz or marble composite, or woods like walnut, maple, spalted sugarberry and ash. Designers have tackled the clunky traditional recliner, coming up with some sleeker, more stylish versions. At Room & Board, find the Ellison, Dalton and Harper, which all come in a fine-grained leather and are available with USB ports. The designers at Gjemeni tackled both connectivity and comfort with a collection of comfy leather chairs and sofas that have charging plugs as well as adjustable backs, so you can turn each piece into a seat, a lounger or even a bed. At Wayfair , Brayden Studio’s ash wood Keiper nightstand has a rustic modern vibe that would make it work as a side table anywhere; dual ports sit discreetly on the back. Get the party started and keep it plugging along with AllModern’s Sobro coffee table. Available in black, white or wood finishes, the table is equipped not only with outlets and ports, but a built-in fridge, speakers and LED mood lights around the base. Operate everything from the tabletop; no apps required. 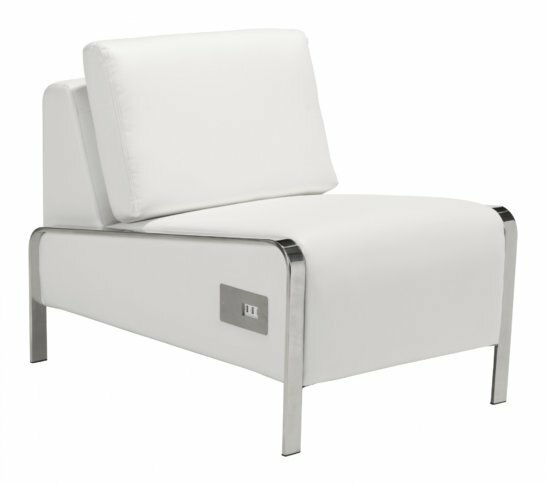 Also at AllModern, the LeeAnne slipper chair in black or white leatherette has a three-port USB panel on its side. Ikea’s pert little Nordli nightstand has a hidden shelf for a power bar, and a groove up the leg to tuck in the cord. Simpler still is the Seljie nightstand, with a cutout in the back panel to run a power-bar cord into the drawer. If you prefer retrofitting existing pieces, there are options. In the bedroom, consider Studio 3B’s four-piece bed-lift set; the lifts raise a bed 7 inches, and one of the legs houses two grounded outlets plus two USB ports. From Legrand comes a port-and-plug power bar you can screw or clamp onto any edge to create connected furniture; the black or white/gray unit comes with a 6-inch cord.